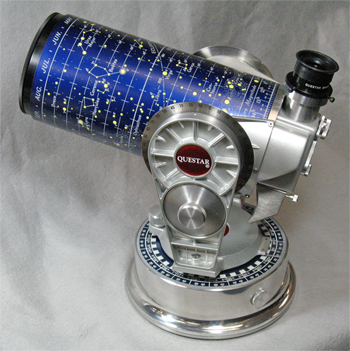 The Questar Standard 3-½ has for nearly sixty years been regarded as the finest compact personal telescope in the world. The Questar is an American made family of telescopes and accessories offering unprecedented convenience, manufactured to high industrial levels of perfection and durability. They are made to provide more than a lifetime of rewarding service, and many Questars from the early 1950's remain in service to this day. It has been for many aspiring astronomers the "Holy Grail" of compact telescopes; we hear many who visit our showroom to see a Questar first-hand comment mention they grew up reading the advertisements in "Scientific American" and "Sky & Telescope" - hoping some day they'd own their own. Right: Questar Standard telescope shown with Questar Brandon 12mm eyepiece attached (135,285 bytes). In addition to the telescope's legendary resolution, flatness of field and startling clear contrast, the Standard has integrated convenient features several which are not available with other telescopes. The Standard Questar telescope has won for the United States and Questar numerous design awards, in fact the Questar 3-½ introduced six patented features to the hobby of astronomy. 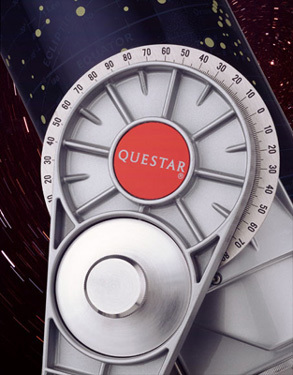 This telescope has been the model of several attempts to mimic its convenience and performance - yet the Questar remains without peer. These features were conceived by the gifted designer, Lawrence Braymer over more than a decade of research and development in what would go into regular production in 1954 as the "Questar" telescope. A cutaway version of a 1965 Questar telescope was displayed and is retained by the Smithsonian Institution Museum of Technology. The concepts that originated with early production Questar telescopes of 1954 evolved into variants for astronomical uses including the more versatile Duplex 3-½, the larger Seven models, and for terrestrial applications the Field and Birder models. The design and engineering features made the Questar telescope "user friendly" well before Jobs and Wozniak gave the world the "Macintosh" computer; if Macintosh is the computer for the rest of us, then a good case can be made that the Questar is "the telescope for the rest of us". So, for example one could use the 24mm Brandon eyepiece at 4X with the Finder, then select 50X through the telescope, then increase the magnification to 80X or more by dialing in the Barlow*. Observing through the any of the three magnifications can be achieved and changed without the observer ever moving away from the eyepiece! The provided telescope Barlow is approximately 2X, but we have seen a range over the years of from 1.6 to more than 2X. Company Seven's testing process measures it exactly, and we provide the information to our customers so that they may make better choices of eyepieces. The telescope set includes an off-axis glass Solar Filter for the telescope objective (a full aperture filter is an optional upgrade) providing a pleasing orange red Sun with fine details including Sunspots and Faculae. The Control Box incorporates a solar filter for finder lens to facilitate finding and centering the Sun in the field of view of the telescope and to prevent the accidental observing of the Sun through an unfiltered Finder. The barrel of the telescope is silk screened with a functional Moon Map, while the removable slide on Dew Cap incorporates a functional Star Chart. The equatorial Fork Mount of the Questar is made of a brushed cast aluminum which is then lacquer painted. Each of both axes has a manual friction drive control, the Right Ascension also having slip clutch permitting manual override of the tracking motor. The mount includes an AC powered synchronous clock drive motor (world wide portable 9 volt drive corrector optional), driven Right Ascension setting circle, and a Declination circle with declination motion variable clutch lock. The drive is smooth enough to provide flawless tracking of celestial objects for visual applications, although the telescope can easily be accessorized to introduce one into most types of film or CCD astrophotography. Left: Questar Standard telescope shown in Pole Aligned position on it's table top tripod, and at right stored with standard accessories stored in the case (13,309 bytes). The Questar Standard 3-½ telescope stores into a furnished compact Vinyl Clad Carrying Case (easily "carry on luggage") that has pockets sewn in the liner to accommodate the included table-top tripod legs, an extra eyepiece, the solar filter, and AC adapter cord. There is also a pocket for the optional Powerguide Controller for worldwide 9 volt D.C. battery powered operation. Right: Questar Standard Fork Mount. Close up view of Declination Setting Circle, with knurled Declination/Altitude lock knob (47,717 bytes). When you wish to use your Questar 3-½ astronomical telescope in the backyard or at a location with no convenient platform to set up the provided table-top tripod, we recommend you consider a third party good quality rigid field tripod. Or for even better convenience, consider our Questar Tristand. The Tristand is refined, compact telescope equatorial platform and pier which places the Questar 3-½ eyepiece at a comfortable 41" height. A taller Astropier is also available. The Astropier and Tristand are suitable for use in latitudes from 26 to 90 degrees, or 4 degrees with the optional Wedge. 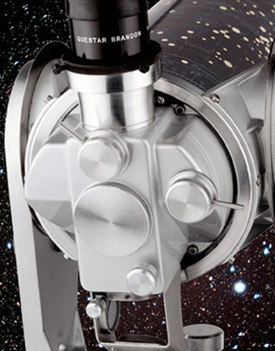 For more information about how to work your way through the decision making process of choosing and specifying your Questar 3-½" telescope feel free to contact us, or visit our showroom, or refer to the article in our Questar Notes/Library section "How to Choose a Questar Astronomical Telescope". For current dimensions and a construction overview of the Questar Standard 3-½ telescope sold by Company Seven download the Questar illustrated two page brochure from Company Seven's Library. Download size is 348,071 bytes (in Acrobat Reader ".pdf" format).